what (‘s a crazy/interesting story behind one) : 10 years ago I found a cool grey phone in a thrift shop in Amsterdam and carted it all the way home in my suitcase. 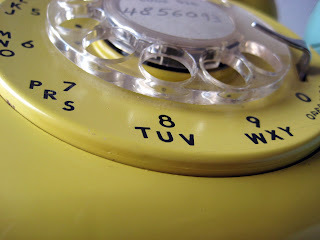 what (piece would you like to add): A brown or orange rotary phone. why (do you love them) : I love the design and the colors. Also, they remind me of a time before cell phones and other annoying technology. which (one is your favourite) & why : It changes - right now I'm keeping the mustard yellow phone out because it seems the most summery. i just love this gorgeous collection. so nostalgic & fresh & beautiful! thank you! 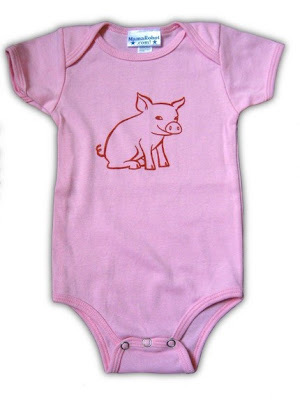 and i just adore the MamaRobot shop: Amanda's wonderful artworks, featured on organic clothing for babies, and "shirts and more for adults!" i love her designerly graphic style and adorable silkscreened designs, reflecting sweet little moments in roboworld life! 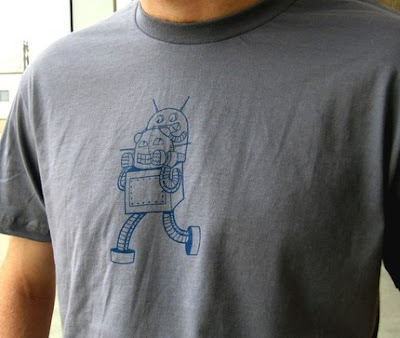 i know my own cute hubby would just love that fabulous men's robo tee with little robot on his shoulders (father's day is coming up!)... so sweet for the daddy's in your life! so be sure to visit her cute cute shop, and wonderful blog, too. We used to have that exact same black phone! This is a super collection!!!!! oooo! thank you mamarobot! 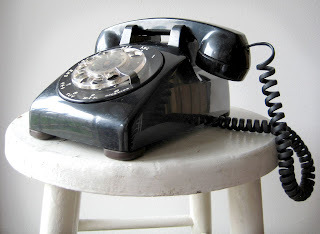 I just love old rotary phones, too. i recall it being so satisfying when you dialed that zero, and the wheel went aaaall the way around. & my little guy >loves< robots! what a fun collection! i rarely see rotary phones, so i never thought of collecting them. i have one old black one though! it's funny how the topic of collections has come up this week. i was talking about collections on monday, about what all i collect, how long i've been collecting, how many pieces each collection has, and what i collected as a kid, therefore starting the collecting bug! and i've spent the last few days trying to organize my ridiculous button collection! I LOVE those phones. My grandmother actually still had and used hers as of last year! Wonderful collection. I love her shop, too. Awesome collection! I'd love to have it. I like your work too! 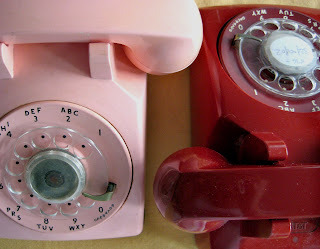 My mom still has a black phone just like these down in her basement! My kids look at it completely bewildered! Love all the colors! Excellent. I just love them. 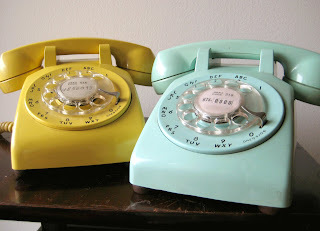 I know a store that has a shelf full of these old phones, in all shapes and colors. What an awesome collection! oh i agree! i love this collection! thanks again, mamarobot! Phones today are so dull. with thanks: to you & redbook magazine!